Assassination attempt casts shadow over Armenian election. 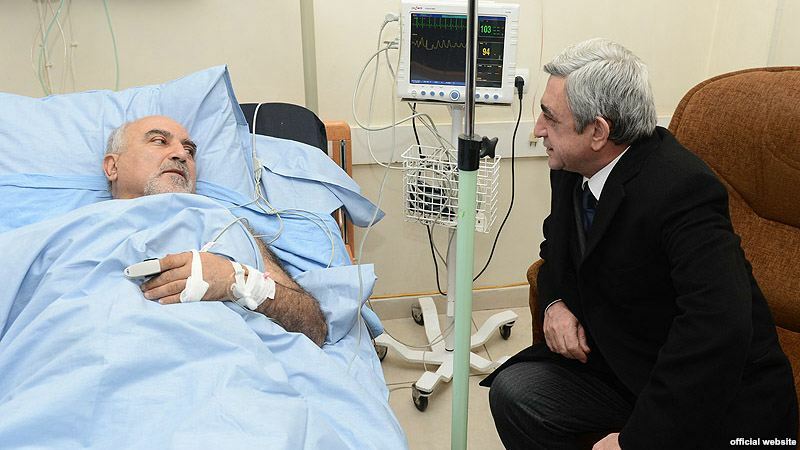 President Serzh Sargsyan visiting Paruyr Hayrikyan in hospital on 2 February 2013. On Friday evening, 1 February a gunmen shot and wounded Armenian Presidential candidate Paruyr Hayrikyan casting a shadow on what had so far been a lacklustre election campaign. Hayrikyan is not one of the front runners in the campaign, but is a respected and recognised figure in Armenian society. He was a dissident in Soviet times and served time in prison for his political views. Hayrikyan was operated on the following day and a bullet removed from his shoulder and is now recovering satisfactorily. The assassination attempt however reminded Armenians of the level of violence in their political life in recent years. In October 1999 several senior members of the Armenian government were killed in cold blood in an incident inside the Armenian Parliament. They included the Prime Minister and the Speaker of Parliament. In 2008 eleven people died in incidents on the streets of Yerevan as protestors questioned the results of the last Presidential election which brought the current incumbent Serzh Sargsyan to power. Such violence in a country of such a small size and which is monoethnic is unprecedented and has left the Armenian body politic scarred. Big questions remain around both the 1999 incident in the Armenian parliament and the 2008 street protests, and the assassination attempt against Hayrikyan is likely to be added to the list adding to speculation of sinister forces at work. Up to this point pro government politicians had been going to great lengths to project the election as business as usual despite the fact that a number of major political forces have distanced themselves from it. The assassination attempt however opened up a series of questions about the state of Armenian politics, and where it was heading, and about forces at work behind the scenes. Many young Armenians are also completely disillusioned by politics and refuse to be engaged with it. Since coming to power in 2008 Serzh Sargsyan has tried to deal with some of the issues, including the role of quasi criminal business interests in the political process, but critics say that too little was done too late and that a more thorough clean sweep was necessary. Some of the candidates in the election announced that they were suspending their campaigning until Hayrikyan is able to return to his campaign. Candidates, including the incumbent president visited Hayrikyan in hospital and all political forces condemned the attack describing it as an attack against Armenia and its institutions. There is some speculation that the election may have to be postponed by two weeks because of the incident. This will happen if Hayrikyan petitions the constitutional court and if the court agrees. The incident was an unwelcome development for President Sargsyan who is keen for a proper election process to re-enforce his legitimacy. Western governments and international organisations issued statements condemning the attack and calling on all Armenian political forces to continue operating within the constitutional order. CEW staff team with local media. Prominent activist arrested in Azerbaijan. ODIHR flags up changes in constituency boundaries in Georgia as a priority.